LS/CS is ideal for concrete dustproofing applications such as warehouses, distribution centers and other exposed slabs not being decorated. Consolideck LS/CS provides an advanced alternative to conventional sodium or potassium silicate surface hardeners. This penetrating silicate treatment reacts with calcium hydroxide in the concrete to produce insoluble calcium silicate hydrate within the concrete pores. Consolideck LS/CS is appropriate for freshly troweled “green” concrete, or existing floors of any age. Hardening/densifying with LS/CS® renders concrete floors dustproof. When should I use LS/CS? LS/CS is our recommended densifier for concrete floors that require dustproofing only. Where is LS/CS typically used? 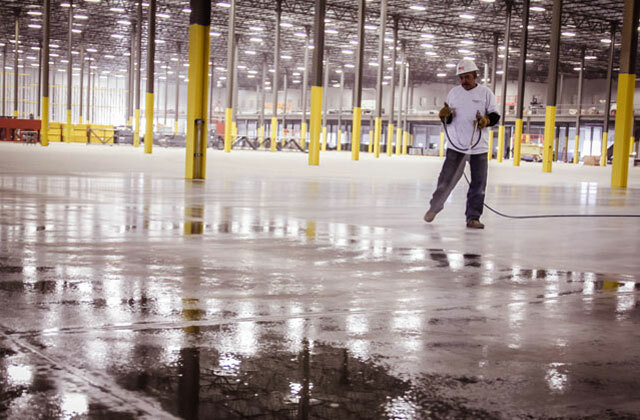 LS/CS is optimized for concrete dustproofing applications such as warehouses, distribution centers and other exposed slabs not being decorated. Is LS/CS a concrete sealer? LS/CS will harden/densify and dustproof concrete surfaces as well as providing some protection from liquids. For maximum protection from stains and spills we recommend a subsequent application of a protective treatment. How long does it take LS/CS to dry? For most situations, LS/CS should be dry in about an hour. What do I do if I over apply LS/CS? How do I remove the excess? Excess product on the surface may crystallize and turn white. Excess product should be removed immediately. You can remove that by scrubbing with water with an auto scrubber. Questions, field support or help finding a distributor?